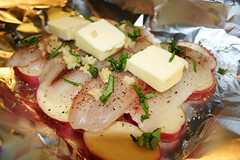 Thinly slice potatoes and place them side by side on a large piece of aluminum foil. Set the tilapia fillets on top of the potatoes. Season each fillet with salt and pepper. Place one tablespoon of butter on top of each piece of fish. Sprinkle garlic, basil, and tomato. Pour wine over everything. Fold foil around fish and seal into a packet. Place packet onto a tray for ease in transportation to and from the grill. 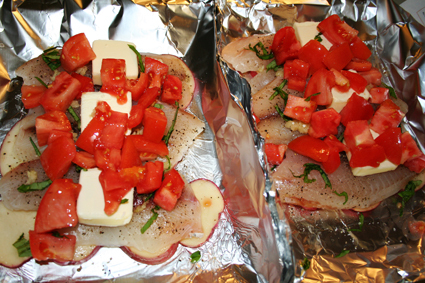 Place foil packet on the preheated grill and cook for 15 minutes, or until fish flakes easily with a fork. Open the packet carefully so as not to get burned from the steam. Serve. 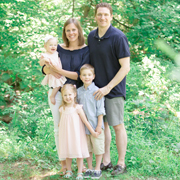 Next PostWhere oh Where has the Warm Weather Gone?